Dinosaur breeding has been introduced to ARK: Survival Evolved in patch v219. 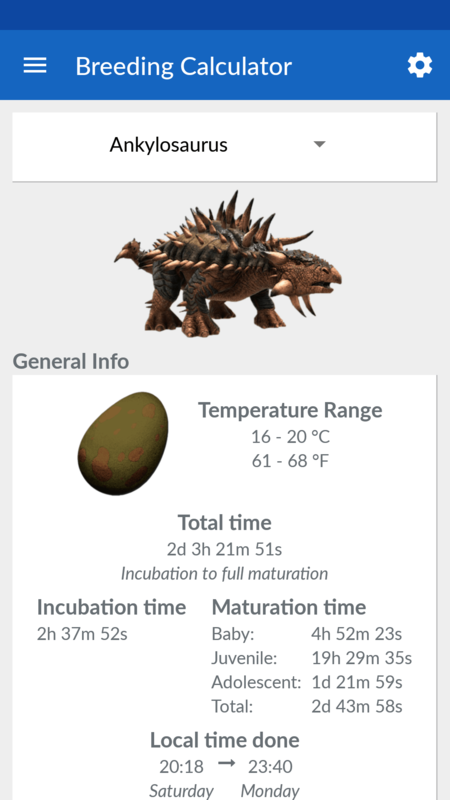 This means that it is now possible to breed your own dinosaurs with their own stats. These stats are based on those of the parent that, with some selective breeding and a lot of time, could result in dinosaurs with very high base stats. For more information on dino breeding, please check out this post that explains it in more detail. The stats of the baby dinos have some randomness involved, which makes it hard to predict the outcome of your breeding. For the amount of resources needed from baby to adulthood, check out the Survive ARK Companion app! It contains a fully functional breeding calculator (and a lot of other cool stuff)! You can download it on Google Play here (Android), or get it in the App Store here (iOS)! For a preview, see the screenshots below. Currently we have a small calculator available that at least shows you the minimum and maximum stats your baby will possibly get. Whenever the new devkit comes around with information on the breeding in it, we will add even more to the calculator to help you guys as much as possible in breeding that ultimate dino! In the calculator you can choose a dinosaur and it will fill in the base stats corresponding to that species. Then you can adjust those stats to correspond to your tamed dinos. Make sure you fill in the post-tame stats (these are the stats your dino has just after it was tamed), as the values of the baby are based on those (except level, we will add something for that in the near future). After you’ve filled in the post-tame stats of both parent, you can click on “Calculate baby stats” to calculate the possible results. The calculator will show you the two extremes for the baby: one that got the ‘worst’ stats, and one that got the best stats from both parents. Mostly you will end up somewhere in between, but at least you will get an idea how far you were away from that perfect baby dino. This is nice, but I’d like to know how long the pregnancy/baby stages might take. If you could incorporate those values this could be a very valuable resource. Gamepedia has those, what I’d like to know is how much food they’d take.. I suggest that you put pictures on here. Dont think its 100% legit now. our baby trike did only get 496.4 in weight when dad did have 1025 and mom did have 1251 how come the baby got so low? lvl of baby 84 lvl of dad 99 lvl of mom 112. Were those stats from the parents really post-tame without any levels put into it? Because the baby stats are based on the post-tame stats of its parents, so any levels you’ve put into weight will not be inherited by it. i want to know the start level if that is possible mother+father/2=baby level? The level is depending on the amount of stat points a baby gains from its parents. Therefore it is not the levels divided by 2, as the baby can even have a level that is above that of its parents. Since there is a ‘hidden’ stat in all dinos (since speed is not visibly increased) it is harder to calculate the real level of the baby. how do you know what the lv will be? Is there a way to check the orginal stats for a dino? 3. since stats are increased x% from their post tame stats, you should be able to find out what the base stats are now (so if the increase was 23 and the stat is 10% of the post-tame stats, then it was 230 post tame). Only problem is that these percentages are different for each of the stats and due to the rebalancing I’m not sure what those percentages currently are..
Do post tame stat increases now affect the next gen?